Brown Trout (Salmo trutta) Brown trout are distinguished by large black and sometimes reddish-orange spots with a pale border on the sides of the fish. These spots are modified Xs when the fish is large. They grow rapidly and may live to an age of six years and reach weights of eight to ten pounds. 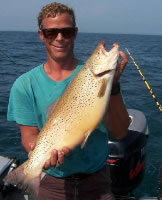 Some may reach 30 pounds in Lake Michigan. They are among the wariest of fish, feeding usually at dusk or at night. Brown trout prefer water temperatures between 55 degrees and 65 degrees F. and are typically found along the shoreline and at warm water discharges. This wary fish can be taken more readily in early morning and twilight hours. Light line is in order using conventional lures or natural baits.